Arkansas Energy Ventures is dedicated to helping the people of Arkansas save money and live better through investing in smart, sustainable energy solutions. Why choose us? We offer you the ability to predict and manage your energy use and spend. Our customers buy more than a solar system, they buy the comfort and security that we offer for their finances and budgeting. These advantages of solar power allow you to secure predictable, long-term energy rates to protect yourself from rising energy costs and price volatility. What you should expect from your solar provider: These are considered best-practices when you are approached by a solar provider. Honest and Dependable Clear and Concise Designs Established Client Communications Prompt and Good Listener Types of Solar Systems: 1. )Net Meter Solar panels are connected to a public-utility power grid and surplus power is transferred onto the grid, allowing customers to offset the cost of power drawn from the utility. 2.) Hybrid Solar Hybrid Systems stores energy for later use in one or multiple solar batteries but then can also pull from the grid in high energy use periods like hot summer months. 3.) Off Grid This option allows you to get off the grid. If you live in a remote area, you should consider this option for its convenience. Let’s say you want a solar electric system for your home. An off-grid system basically consists of solar panels and battery banks. These battery banks store the sun’s energy so you can use electricity at night or on a cloudy day. This system is designed to keep household electricity running for about two or three cloudy days; longer cloudy periods require a backup generator. To install an off-grid system, you’ll want to hire a certified Arkansas solar energy contractor. Along with off-grid solar, wind and hybrid energy systems that include batteries and backup generators, there are also grid-tied solar and wind operations. Grid-tied systems are attached to your Little Rock, AR utility company so if you produce more energy than you use, your meter goes down and you build up energy credits. Can you give me any information on Arkansas solar rebate programs? 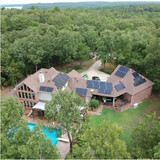 Find solar energy contractors in Little Rock, AR on Houzz. Search the Professionals section for Little Rock, AR solar energy contractors or browse Little Rock, AR photos of completed installations and look for the solar energy contractor’s contact information.